Do you have a pet that needs extra assistance with their health or wellbeing ? Does your pet needs a wellness treatment ? Or do you want to have a supportive constructive full health care option for you pet's health by making the combination of your local Vet and an Energy Healing ? Are you loving your pets as much as I do ? Then you know we Always want to give them the best things that there are for them to enjoy... All Animals Love this 30 days Of Love & Grace program so much. It is the ultimate support for your animals to let them soak up Infinite Pure Love and Infinite Pure Grace energy for 30 days in a row. It doesn't matter if your pet is recovering from an operation or illness, or that you notice it has some emotional issues going on, or when you just want to pamper them with this ultimate wellness treatment. Does your pet loves music ? Does your pet love chanting and soundhealing ? 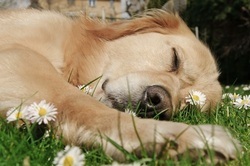 Music and frequency tonations has a very deep and healing effect on animals. Soundhealing brings an animal back into balance with his own natural healing and energetic system.